Cook County, Illinois Commissioner Jesús "Chuy" García speaks at a Bernie Sanders rally in Cedar Rapids, Iowa on Saturday. Cornel West hugs Congressman Keith Ellison at a Bernie Sanders rally in Cedar Rapids, Iowa on Saturday. Cornel West at a Bernie Sanders rally in Cedar Rapids, Iowa on Saturday. Members of the band Foster the People at a Des Moines rally on Sunday. Bernie Sanders' Iowa state campaign coordinator Pete D'Alessandro speaks in Des Moines. Bernie Sanders speaks at a rally in Des Moines Sunday. 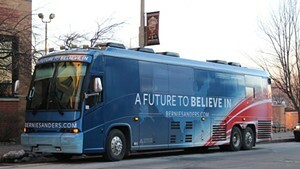 Bernie Sanders speaks to volunteers at Des Moines headquarters Monday morning. 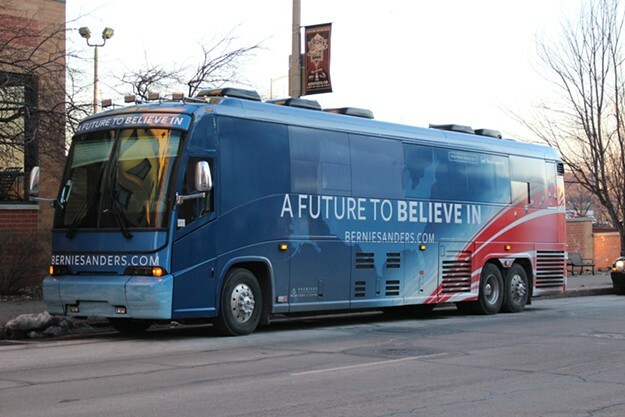 The Bernie Bus leaves Des Moines headquarters Monday morning.